In a capturing race a big eye (大ナカデ) has an advantage over a small eye (小ナカデ) similar to the advantage a group with an eye has over a group with no eye. See eye versus eye capturing race and Eyes win semeais. Both groups have an eye and all liberties are internal. 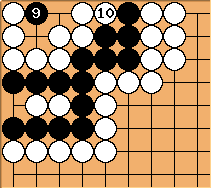 This looks a lot like a seki, but Black is dead. No matter who starts first, white can win the semeai because of his big eye. The group with the big eye has a big advantage in a semeai. Not only does the big eye confer extra liberties, the big eye gets the shared dame for liberties. 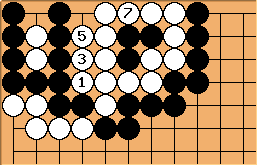 The group with a small eye needs more external liberties if he is to have a chance of winning. This is very much like eye vs no eye semeai. 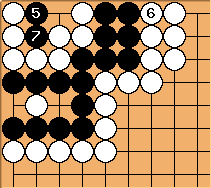 If both players have big eyes, the one with the bigger eye has the advantage. Here White is dead. 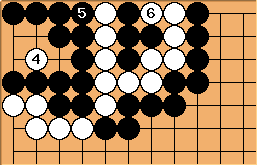 After White has 4 liberties, Black has 7. White is dead. This is the critical position in this semeai. Black has 4 obvious liberties. It looks like White has 3 liberties, but big eyes have more liberties, as a rule. The rule of thumb is that the 4-point big eye has 5 liberties. 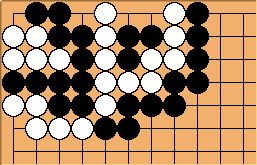 Black has played one, so White has 4 left. Whoever plays first wins. 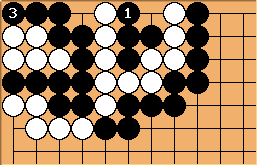 Black is plainly one move ahead, now. White is dead. 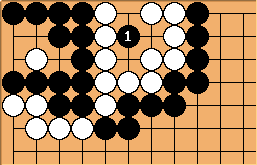 Now White is plainly one move ahead. Black is dead. We have altered the position by giving the groups one shared dame, . Since the groups started with the same number of liberties and each has an eye, is this seki? Actually, no. The shared dame is a liberty for the big eye, White, so Black is dead. 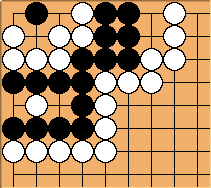 To show that, Black to play loses and cannot make seki. Now if Black plays at White will take Black's corner stones and Black will lose, so passes. The order of play is important. 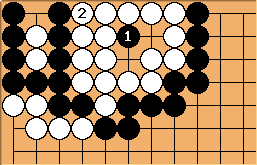 If White takes Black's stones before almost filling Black's eye, Black can make seki. IL(W) = 5-3 = 2 , hence one more.